Measurement of electrical conductivity for liquids and aqueous solutions is very crucial in many production areas, whether to check the general conductivity, to control the ionic compounds in the liquid or to guarantee the purity of the liquid. Measuring instruments from Kobold offer a reliable and long-lasting solution for industrial use. They are used both as hand instruments and as fixed measuring instruments worldwide. If anyone has to measure the conductivity of water and has to check these values permanently and reliably, he usually relies on permanent and easy to install conductivity devices. These are available both as inductive and as conductive conductivity measuring devices. 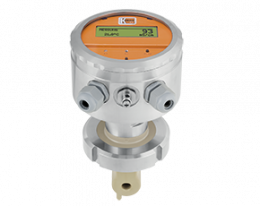 The type of measurement can be easily adapted to the liquid used and the installation position in the production environment. 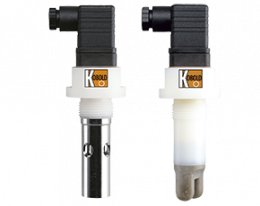 Kobold conductivity meters are also known for their excellent manufacturing quality, high stability and long durability. This means that the measuring instruments - whether installed permanently or as a temporary solution - can be used without any problems even under the most adverse circumstances. Conductivity of water plays an important role in many production areas and industries. The conductivity devices allow many tests to be carried out during operation, which in the worst case would require a production stop and a check in the laboratory. The electrical conductivity of water can be used, in particular, for the verification of ionic compounds, for the checking of a uniform distribution of constituents. Many companies use the measuring devices for electrical conductivity of water in their own production plants and, by automatic control of the corresponding values, facilitate optimum automation and a faster production process. Conductivity measuring devices are also widely used in the field of cooling technology, for example in order to ensure the purity of the water used in a cooling circuit. De-ionized water used in this case must not exceed the set limit values for conductivity, since otherwise the desired cooling effects of water in cooling circuit would no longer exist. A stable and safe automation by means of measuring instruments and transmitters can improve the work in these areas on a lasting basis and make working and production conditions easier and faster. Conductivity measuring devices can use the transmitters to implement the determined data via different outputs into various systems. 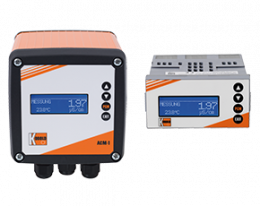 Kobold conductivity measuring devices can thus be easily integrated into a wide variety of systems without great effort. Various factors play an important role in determining the electrical conductivity of water. In addition to pure electrical conductivity, temperature of the medium must also be set as a reference every time. For this reason, instruments used for measuring the electrical conductivity of water always have an integrated temperature sensor. It is only by combining the two values that a valid result can be obtained. This applies not only to permanently installed conductivity measuring instruments, but also to hand-held measuring instruments. 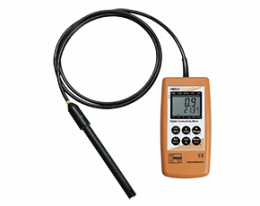 These hand-held instruments, such as the HND-C hand-held measuring device, have a permanently connected sensor, which can reliably read both the conductivity of the medium and its temperature in a safe and error-free manner. 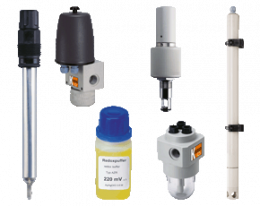 In addition, different versions of these measuring instruments can not only precisely determine the conductivity and temperature of liquids, but also provide additional functions. Among other functions, the resistance and the salinity of the liquid can be determined in few steps. Thus, all important data and facts are available at a glance, which makes various work steps unnecessary. For mobile control in various areas of a production plant or for correct measurement at particularly critical workplaces, such a solution with a hand-held measuring device is an excellent choice. In chemical production, as well as in food production or in the field of pharmacy, Kobold hand-held meters are used by leading manufacturers worldwide to control the conductivity of liquids.